Dining Al Fresco at La Maison du Séminaire. There’s a lot to be said about the unheralded beaches on Nice’s eastern coast: Coco Beach, La Reserve, Bains Militaires. Few tourists frequent these beaches mainly because they are far from the hotel sector and the rocky coastline is not to everyone’s taste. Those that do venture this far east are rewarded with unparalleled views over the entire Baie des Anges. The coastal path that winds its way along the water nearly as far as Villefranche-sur-Mer is another good reason to make the journey. For such exertions, sustenance is necessary and there are a few good options here. At the top-of-the-line is La Reserve which offers elegant but pricey gourmet treats on a terrace and glassed-in dining room right over the water. At the bottom of the line. . .well, there is no bottom of the line here. There are no snack shops or sandwich stalls or any kind of takeaway food. Mid-range dining includes the Nautical Club of Nice which offers simple dishes overlooking the water every day but Monday and Coco Beach restaurant which specializes in fish and unpredictable hours. 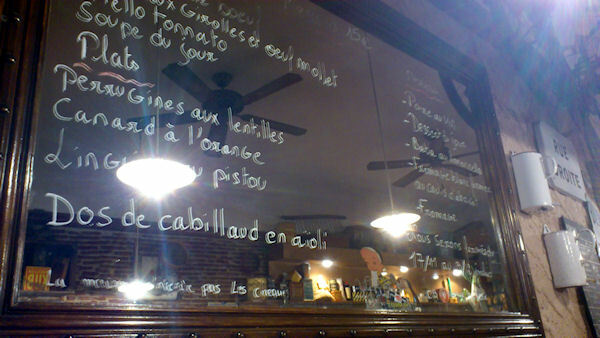 Another excellent choice is the restaurant of La Maison du Séminaire just across from La Reserve on bd Franck Pilatte. This 19th-century seminary is in the process of transforming itself into a luxury hotel and sports a long terrace with views over the sea as well as a modern interior dining room. The menu is reasonably-priced and offers a range of Mediterranean-accented dishes with an emphasis on meat and pasta. They also boast a weekday lunch deal of €16 for a two-course meal and €20 for a three-course meal. We were most pleased with the ravioli stuffed with ricotta and spinach and the daily special of beef wrapped in noodles with a side of panisse. “Yummy yummy yummy I got love in my tummy” Remember this bubblegum hit from 1968? No? Anyway, that’s how I felt after eating at Chez Palmyre ( 5 rue Droite, Nice; tel 04 93 85 72 32) last night. It’s all about love, man, and this tiny bistro in Old Nice serves up love on a plate. Created in 1926 by a mother-daughter team, Chez Palmyre attracted a devoted crew of regulars by turning out an ever-changing menu of Riviera comfort food. 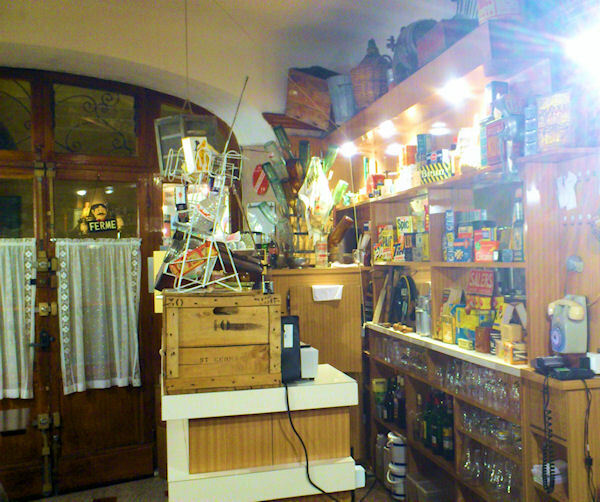 Along the way, it gathered memories and mementos that are cheerfully stuffed onto the walls and behind the counter. If your grandma lived in Nice and opened a restaurant, this is what it would look like. After mother and daughter left this earth and France respectively, the restaurant was taken over by Vincent Verneveaux, formerly of Guy Savoy who brought a light, modern touch to the traditional food. The menu changes every two weeks and includes a choice of four starters, main courses and desserts. Notice the nice choice of meat, fish and veggie dishes which may have been a break with the restaurant’s old-time probably meat-centric choices. I began with a flaky tart topped with girolles mushrooms and a soft-boiled egg. Fragrant. The aiöli centered on cod fillet rather than the traditional salted morue which was fine as sometimes morue can be a bit tough. Others at the table chose the duck in orange sauce which was copious and hearty. Too bad for the low-carbites that didn’t taste the chewy, delicious sourdough baguette, perfect for sopping up the aiöli sauce. 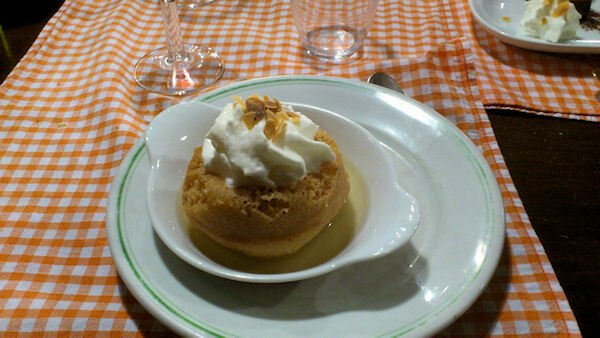 The desserts were simple and delicious arrangements involving chocolate or poached pear or pastry in rum sauce (below). As the restaurant only seats 25 at the very most, it is essential to reserve at least a week, probably two weeks in advance. Oh, I forgot to mention the PRICE of this three-course menu is only €15! What’s not to love? 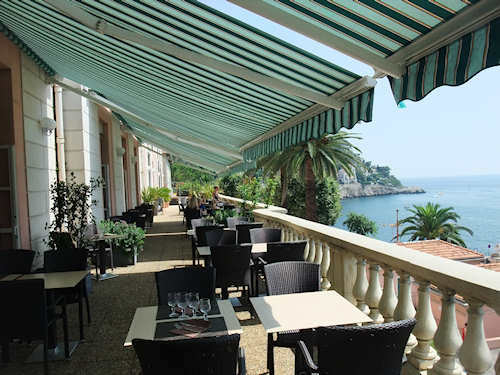 See more on restaurants in Nice. Nice Port was lively, to say the least, on this Saturday night in August. The row of restaurants along the Quai des Deux Emmanuel had lined up their tables outside and made sure that a wall of sound surrounded their customers. At a certain point we realized that we were listening to three separate musical tracks coming from different restaurants even though our restaurant mercifully spared us background music. Thank you Paloma Cantine. 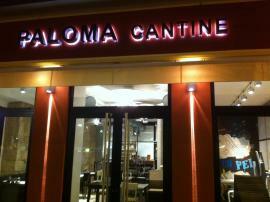 The attempt at some calm was not the only welcome touch at Paloma Cantine. I love traditional Niçois dishes like pissaladière, grilled sardines, bagna cauda but sometimes they get a little ho-hum. The modern decor here hinted at the fresh, contemporary touch the chef lent to these local staples. The sardines over polenta appetizer was amplified with delicate mixed greens and really first-rate cherry tomatoes in a savory olive oil based dressing. Nice. My second appetizer was a lovely pissaladière topped with rougets. The portions were not super-copious though, so don’t think you’ll get away with ordering an appetizer and calling it a meal. See more on Nice restaurants.